Quite some time ago, I received a tiny little vase from a co-worker for Christmas. I was pregnant for the first time and when she explained what it was, it brought joy to my heart. You see, this tiny little vase is a Mother’s Vase. It is the perfect size to put short stemmed flowers picked with love by little hands. No floating, no drowning, no drying up on the window sill… perfect to display little flower and leaf treasures. My daughter actually brought up the idea to me to make one for her teacher to say thank you at the end of this year. My daughter and her teacher’s daughter are on the same soccer team so she knew her friend would love to pick flowers for her mom too. So off to the craft store I went! Small glass jar (this was the hardest thing to find!) Hobby Lobby had a nice variety when I made this craft. 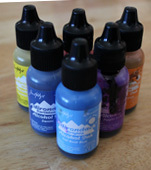 Alcohol Ink: Ranger makes a huge variety of colors and a little goes a very long way! Typically the colors are sold in packs of 3. Polyurethane sealer: There are many different sealers out there and ventilation is required for all I have come across. Be sure the sealer you pick is suitable for glass. Wire: You can wire wrap the neck of the bottle for added decoration if you like. A softer gauge wire you are able to bend with your fingers if you like. You can also use needle-nose pliers to manipulate the wire as well. You will need a pair of wire cutters as well. If you go this route, you can also add beads and charms onto the wire for more pizazz! I think the vases look lovely both with and without this step. Be sure to work on a covered surface and wear gloves if you do not want your fingers stained. Alcohol ink is nearly pure pigment and super vibrant which is why it is so great for this project. It will, however, stain EVERYTHING! (If you do happen to get it on a surface, the magic eraser pads work well on it. You can also try rubbing alcohol. 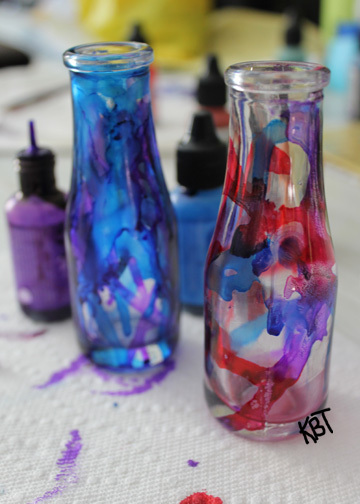 With the bottle in hand, drip a drop of alcohol ink onto the surface of the bottle and either twist the bottle to help it spread or blow onto the ink to help it spread. Both have cool effects. You can drop the ink at the top and allow it to drip down toward the bottom or hold the bottle horizontally for more precision drips. The ink dries very quickly so spread with your chosen method as soon as you drop the ink. Once completely dry and colored as desired, apply several coats of sealer, leaving adequate time for each coat to dry. The coating I used had a matte finish so it too “textured” the glass where the ink did not cover. After the bottle is sealed, cut a piece of wire sufficient to wrap around the neck of your bottle several times. 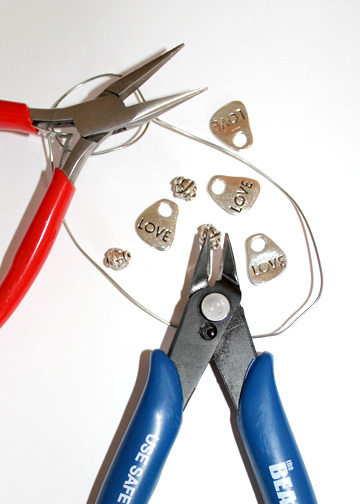 Place charms or beads onto the ends and simply twirl them to finish the wire off. If you have a pesky sharp wire, use a heavy acrylic nail emery board/nail file. That usually does the trick! I would love to see what you make if you try this project out! Be sure to leave a link in the comments so we can all see your creation!